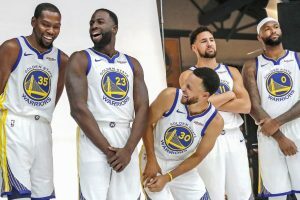 OAKLAND, Calif. — Dwyane Wade knows something about assembling a superteam, and the Miami Heat great believes the addition of DeMarcus Cousins makes the Golden State Warriors’ All-Star starting five perhaps the best the NBA has ever seen. “That is as good as it gets in our game with any team ever to play this game,” Wade said. “That is as good as it gets with a starting five. That is why they are who they are, that is why they are champions. At the start of the decade, Wade helped Miami assemble its big three by teaming up with LeBron James and Chris Bosh in Miami. The power move by James — leaving Cleveland to form a new superteam — helped set the trend of superstars looking to join forces with other stars when they become free agents for the best opportunity to win championships. “He’s basically single-handedly negated the dog days, he really has,” Golden State coach Steve Kerr explained. “These last games before the All-Star break, usually from early January on, you got a three- to four-week stretch where everybody is just trying to get to the break. We bypassed that. Wade, though, thinks that other teams will find a way to eventually catch up to Golden State’s super five. “People always find a way,” Wade said. “The superteams go back a long way, way before the Miami Heat did it. Having Hall of Famers, multiple Hall of Famers on one team. The league will continue to put the right talent around.